I wanted to write, so here I am, opening my heart to all who want to read the stories of my harsh but sometimes comical youth as a young girl growing up on a dairy farm in Upstate New York. Everything written is true. My life never needed any embellishments to be colorful. 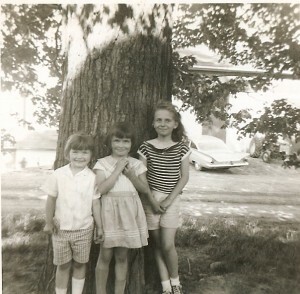 That’s me in the middle, many years ago. Overheard in the Country is powered by	WordPress 2.9.2 and delivered to you in 0.531 seconds using 16 queries.